***PRICE JUST REDUCED*** CLEAN TITLE CERTIFIED! ONE OWNER!! Comes with 12 Month/ 12,000 POWER TRAIN WARRANTY!! This vehicle is at 205 E. State Pleasant Grove, UT 84062. 6 passenger seating. Bring the romance back in your relationship with bench seating up front. Let your honey saddle up right beside you. Range-topping engine is an E85-capable 5.4-liter V-8 with 320 horsepower and 390 pound-feet of torque. 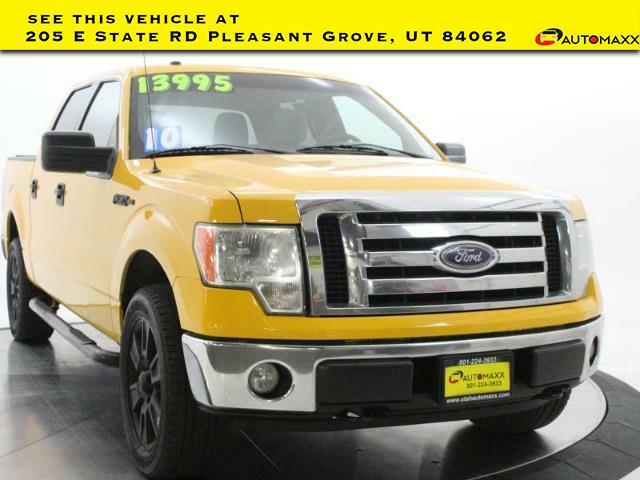 2010 Ford F-150 XLT Awards: * 2010 KBB.com Brand Image Awards -----Automaxx Pleasant Grove-Utah Countys Only UN-Authorized Jeep dealer! --- All vehicles come with a 12 month/12,000 mile Powertrain WARRANTY for your PEACE of MIND! --- Winner of the 2018 and 2012 Quality Dealer Award in Utah and in business since 1998. ---Find us at 205 E. State Pleasant Grove UT 84062. Open 10am to 7pm Monday to Saturday. Or call 801-679-6688! !